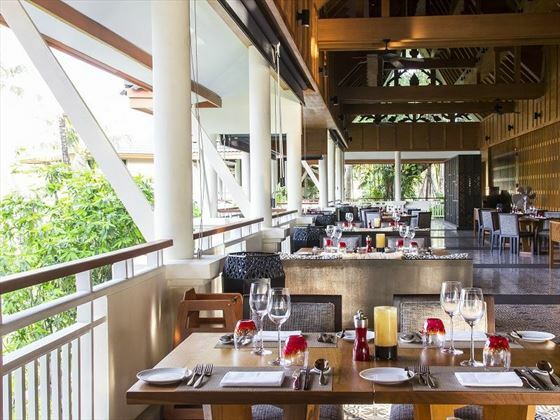 Situated between the Andaman Sea and a beautiful tropical lagoon, the recently renovated Outrigger Laguna Phuket Beach Resort is the perfect combination of laid-back ambience and sophisticated luxury. 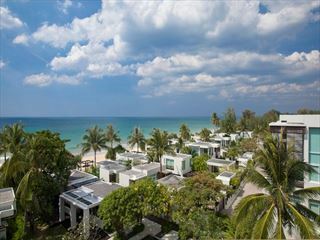 Offering views of the famous Bangtao Beach, you’ll be relaxed from the moment you arrive – the beachfront location is a fitting backdrop to an idyllic tropical retreat. 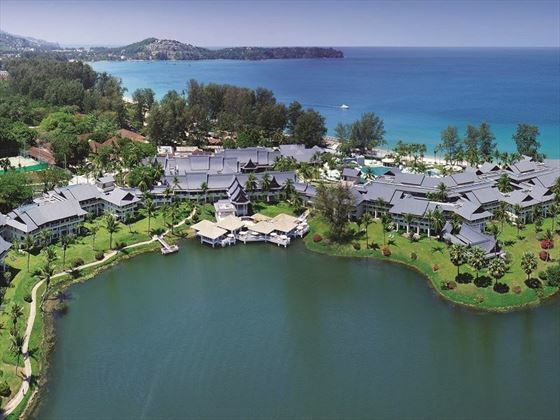 There’s a range of sporting facilities, including a fitness centre, dive and tennis centres, and badminton courts plus a fabulous Banyan Tree spa. 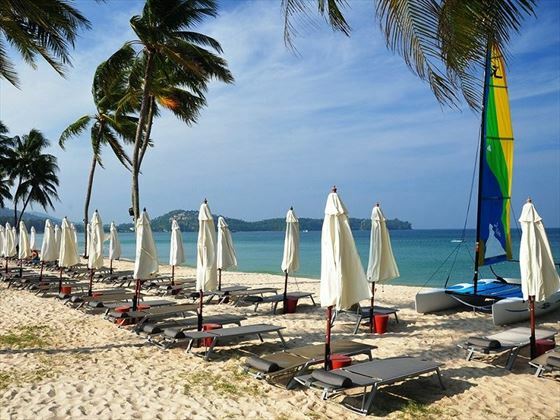 If you want to see what Phuket has to offer, there’s also an activities desk where you can arrange tours and excursions during your stay. 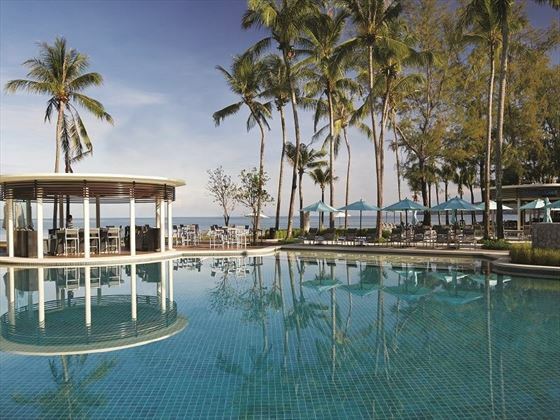 The outdoor pool has an adjacent sundeck and bar, and there is a choice of four restaurants and bars to choose from offering a range of freshly-prepared dishes and refreshing drinks. Top tip: The hotel is situated within the Laguna Destination Resort so if you visit any of the hotels and bars outside of the hotel, you can still sign everything back to your room – so no need to carry any cash! 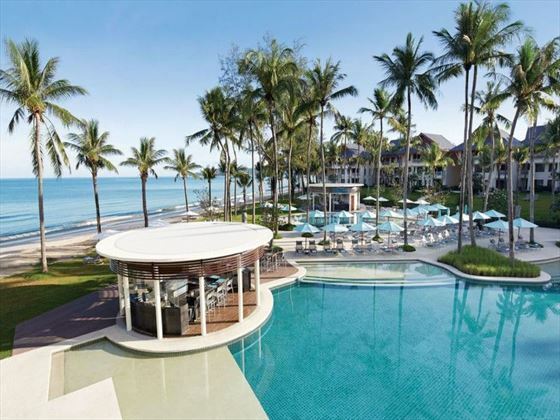 Nestled on the stunning Bangtao Beach, you'll be taken aback by the beautiful views of tropical lagoon and pristine white sands. 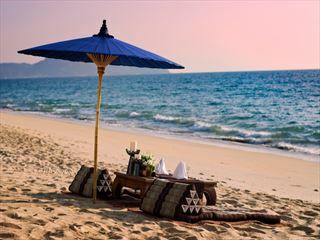 This area is home to the famous Laguna Phuket, an idyllic destination with crystal-clear waters and a serene ambience. 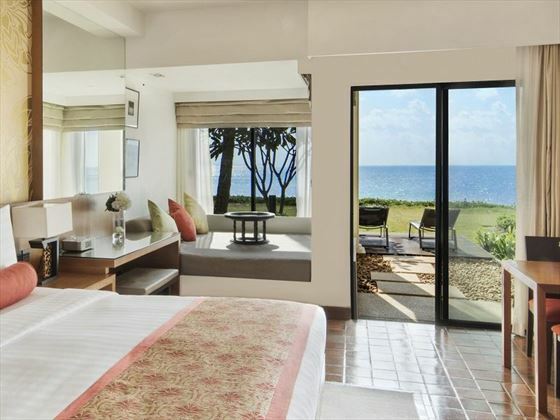 Lagoon view / Ocean view balcony or terrace / Ocean Front balcony or terrace - With 43sqm of space, these room types are contemporary, bright and comfortable with a king size bed or two twin beds and a separate daybed for lounging. The ensuite features a sunken bathtub and shower combined and the outdoor area is complete with a table suitable for dining. Rooms sleep a maximum of 2 adults and 2 children (under 12 years). 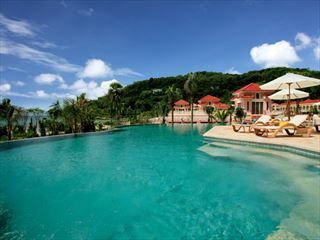 They are categorised according to their position in the resort and therefore the view. Club Lagoon view / Club Ocean view / Club Ocean Front - Featuring 54sqm of space, these club rooms include a bedroom with either a king size or two twin beds, a sitting area, outdoor space complete with a tabl suitable for dining on the terrace or balcony and an ensuite including a sunken bathtub and a separate shower with bathrobes. Guests staying in these rooms have access to the Voyager 47 Club Lounge (see details below). Sleeps up to 3 adults or 2 adults and 2 children (under 12 years). 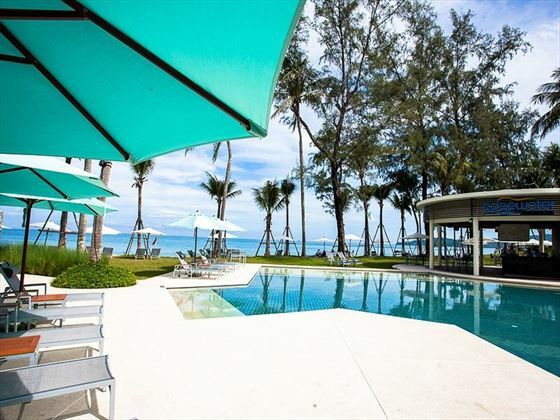 They are categorised according to their position in the resort and therefore the view. Lagoon View one Bedroom Suite / Ocean View one Bedroom Suite / Ocean Front one Bedroom Suite - With 104sqm of space these areas feature a king size comfortable bedroom with a separate living room perfect for relaxing and includes a dining table for four guests should you wish to dine in room. The ensuite is complete with a sunken bathtub and separate shower with bathrobes. Guests staying in these suites enjoy access to the Voyager 47 Club Lounge (see details below). Sleeps up to 3 adults or 2 adults and 2 children (under 12 years). 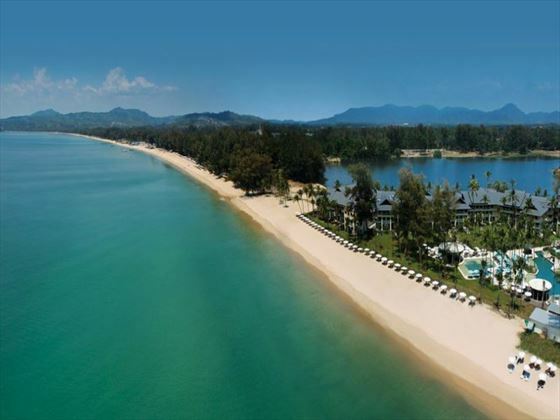 They are categorised according to their position in the resort and therefore the view. 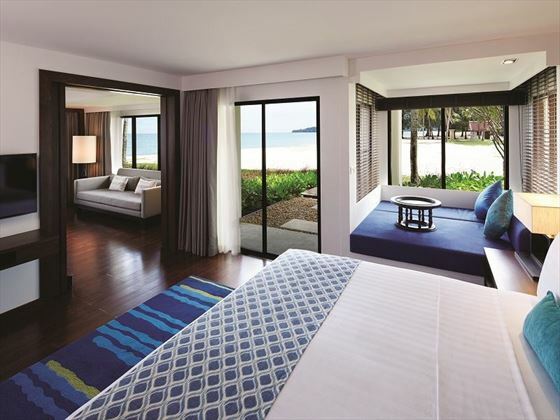 Lagoon View two Bedroom Suite - 120sqm of space including a master king-size bedroom and second bedroom with two queen size beds, both complete with ensuites featuring a bathtub and separate shower with bathrobes. 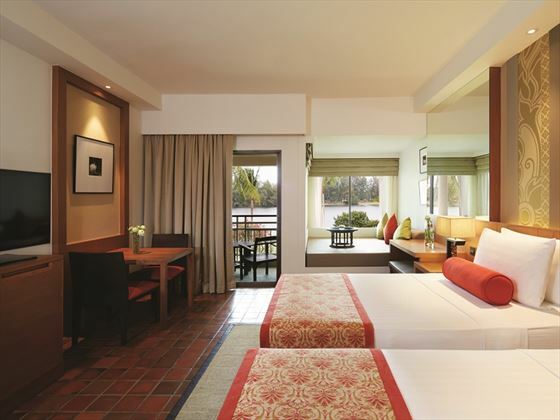 Suites are situated on the ground floor with calming lagoon views from the terrace. Guests staying in this suite enjoy access to the Voyager 47 Club Lounge (see details below). Sleeps up to 4 adults or 2 adults and 2 children.